Vitamins have diverse biochemical functions. Vitamin A acts as a regulator of cell and tissue growth and differentiation. Vitamin D provides a hormone-like function, regulating mineral metabolism for bones and other organs. The B complex vitamins function as enzyme cofactors (coenzymes) or the precursors for them. Vitamins C and E function as antioxidants. Both deficient and excess intake of a vitamin can potentially cause clinically significant illness, although excess intake of water-soluble vitamins is less likely to do so. Before 1935, the only source of vitamins was from food. If intake of vitamins was lacking, the result was vitamin deficiency and consequent deficiency diseases. Then, commercially produced tablets of yeast-extract vitamin B complex and semi-synthetic vitamin C became available. 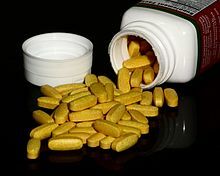 This was followed in the 1950s by the mass production and marketing of vitamin supplements, including multivitamins, to prevent vitamin deficiencies in the general population. Governments mandated addition of vitamins to staple foods such as flour or milk, referred to as food fortification, to prevent deficiencies. Recommendations for folic acid supplementation during pregnancy reduced risk of infant neural tube defects. Although reducing incidence of vitamin deficiencies clearly has benefits, supplementation is thought to be of little value for healthy people who are consuming a vitamin-adequate diet. A dietary supplement is a manufactured product intended to supplement the diet when taken by mouth as a pill, capsule, tablet, or liquid. A supplement can provide nutrients either extracted from food sources or synthetic, individually or in combination, in order to increase the quantity of their consumption. The class of nutrient compounds includes vitamins, minerals, fiber, fatty acids and amino acids. Dietary supplements can also contain substances that have not been confirmed as being essential to life, but are marketed as having a beneficial biological effect, such as plant pigments or polyphenols. Animals can also be a source of supplement ingredients, as for example collagen from chickens or fish. These are also sold individually and in combination, and may be combined with nutrient ingredients. In the United States and Canada, dietary supplements are considered a subset of foods, and are regulated accordingly. The European Commission has also established harmonized rules to help insure that food supplements are safe and properly labeled. 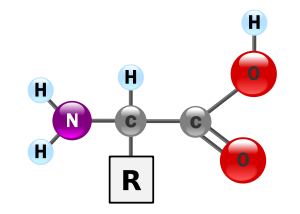 In biochemistry, amino acids having both the amine and the carboxylic acid groups attached to the first (alpha-) carbon atom have particular importance. They are known as 2-, alpha-, or α-amino acids (generic formula H2NCHRCOOH in most cases, where R is an organic substituent known as a "side chain"); often the term "amino acid" is used to refer specifically to these. They include the 22 proteinogenic ("protein-building") amino acids, which combine into peptide chains ("polypeptides") to form the building-blocks of a vast array of proteins. These are all L-stereoisomers ("left-handed" isomers), although a few D-amino acids ("right-handed") occur in bacterial envelopes, as a neuromodulator (D-serine), and in some antibiotics. Oral hygiene is the practice of keeping one's mouth clean and free of disease and other problems (e.g. bad breath) by regular brushing of the teeth (dental hygiene) and cleaning between the teeth. It is important that oral hygiene be carried out on a regular basis to enable prevention of dental disease and bad breath. The most common types of dental disease are tooth decay (cavities, dental caries) and gum diseases, including gingivitis, and periodontitis. General guidelines suggest brushing twice a day: after breakfast and before going to bed, but ideally the mouth would be cleaned after every meal. Cleaning between the teeth is called interdental cleaning and is as important as tooth brushing. This is because a toothbrush cannot reach between the teeth and therefore only removes about 50% of plaque off the surface. There are many tools to clean between the teeth, including floss, flossettes, and interdental brushes; it is up to each individual to choose which tool he or she prefers to use. 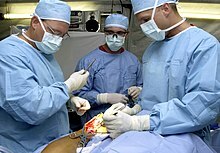 The healthcare industry (also called the medical industry or health economy) is an aggregation and integration of sectors within the economic system that provides goods and services to treat patients with curative, preventive, rehabilitative, and palliative care. It includes the generation and commercialization of goods and services lending themselves to maintaining and re-establishing health. The modern healthcare industry is divided into many sectors and depends on the interdisciplinary teams of trained professionals and paraprofessionals to meet health needs of individuals and populations. ... that Rudolf Geigy established health institutes on two continents and started a foundation that awards scholars who combine field and laboratory work in novel ways? 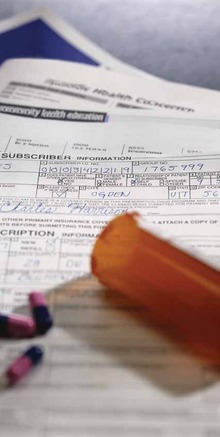 ... that a collaborative practice agreement, which allows a pharmacist to prescribe medications, order drug therapy-related laboratory tests, and design therapy plans, can improve people's health? ... that the orange cup coral obtains part of its nutritional needs from carbon compounds dissolved in sea water? ... that Melahat Okuyan, a Turkish female microbiologist and AIDS activist, once proposed the establishment of male brothels for homosexuals and cross-dressers in order to improve public health? ... that following her diagnosis of terminal lung cancer, the British Vogue health editor Deborah Hutton campaigned to raise awareness of the dangers of smoking for teenage girls? Do you have a question about Health that you can't find the answer to? 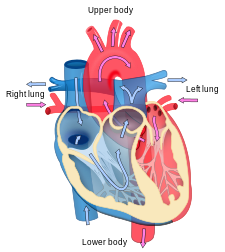 For editor resources and to collaborate with other editors on improving Wikipedia's Health-related articles, see WikiProject Health. By containing his assistant, Armand Seguin, inside a rubber suit fitted with a tube sealed to his mouth with putty, Antoine Lavoisier first measured basal metabolic rate. Drawing by Madame Lavoisier (seated at right). Colorful fruits and vegetables may be components of a healthy diet. Carl von Voit has been called the father of modern dietetics. James Lind conducted in 1747 the first controlled clinical trial in modern times, and in 1753 published Treatise on Scurvy. Followed for a millennium and a half, Galen (1st century) created the first coherent (although mistaken) theory of nutrition. Proteins are chains of amino acids found in most nutritional foods. Takaki Kanehiro surmised that beriberi was a nutritional deficiency not an infectious disease. 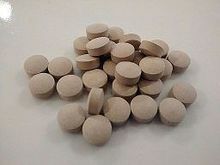 Calcium combined with vitamin D (as calciferol) supplement tablets with fillers.